GLCH is a not-for-profit organisation which is funded from a variety of State and Federal sources for programs, but we still need to raise money to improve equipment and buildings. 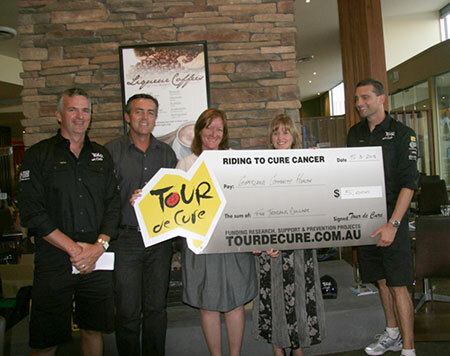 Caption: GLCH was able to purchase a state of the art ‘ImpediMed’ device thanks to a generous $5000 donation from Tour de Cure. The non-invasive tool helps trained therapists detect the early stages of lymphoedema Lymphoedema is a persistent swelling in limbs (or other body areas) caused by fluid build-up. We are fortunate to receive strong support from local community organisations and individuals. Donations are often received either for a specific service or to purchase equipment. Donations of $2 and more are tax deductible. All donations and bequests are acknowledged in writing and a receipt is issued.